What is Cambridge Secondary 1 Checkpoint Program? The Cambridge Secondary 1 Checkpoint Program is typically for learners aged 11 to 14 years (Grades 6-8) and is a challenging academic program with advanced academic curriculum in Math, Science, and English for academically talented students. It enhances the learning environment and prepares students for the academic program at high school level. The Cambridge International General Certificate of Secondary Education (IGCSE) is one of the most recognised qualifications around the world. Cambridge IGCSE courses are renowned for developing vital educational skills, including recall of knowledge, oral skills, problem solving, initiative, team works and investigative skills. The resulting qualification provides a foundation for higher level courses, such as Cambridge A and AS Levels, the Cambridge Advanced International Certificate of Education, the North American Advanced Placement Programme and the International Baccalaureate. Cambridge IGCSE is designed to be taught as a two year course for students aged 14 to 16 years (Grades 9-10). In most subjects there is a choice between core and extended curricula, making Cambridge IGCSE suitable for a wide range of abilities. Where is Cambridge IGCSE accepted and recognised? Cambridge IGCSE is a high-profile qualification. It has exactly the same value in admitting students to institutes of further education and employment as the UK equivalent –GCSE. Cambridge IGCSE is comparable with GCE O Level and the UK-GCSE. 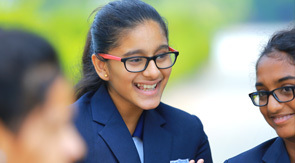 Cambridge IGCSE has an excellent reputation amongst international schools worldwide. Cambridge IGCSE is recognised as a reliable record of achievements which counts towards entry to universities and colleges around the world and in India. Within the curriculum there is a balanced mix of practical experience and theoretical knowledge. With a choice of Core and Extended papers in most subjects, the IGCSE is suitable for students with different levels of ability. The extended level is designed to stretch the most capable student. The IGCSE is a curriculum which allows teaching to be placed in a localized context, making it relevant in different regions. It is also suitable for students whose first language may not be English and this is acknowledged throughout the examination progress. How are Students Graded in IGCSE? Grading is on an eight-point scale (A* G) and grades A to E are equivalent to O Level Grades A to E. In some countries, IGCSE qualifications will satisfy the entry requirements for university. In others, they are widely used as a preparation for A Level, AS, International Baccalaureate and US Advanced Placement courses. ICE is a group award of the IGCSE that requires the study of subjects drawn from five different IGCSE subject groups. It gives schools the opportunity of offering a broad and balanced curriculum by recognizing the achievements of students who pass examinations in at least seven subjects, including two languages and one subject from each of the other subject groups. What are the IGCSE subjects offered at MIS? At MIS, students normally opt for 7 subjects as we encourage all our students to opt for the ICE Certificate. The maximum number of subjects which a student can opt for is 7 and the minimum number of subjects which a student can opt for is 5. However the student would then not qualify for the ICE Award but would however get the IGCSE certificate. "Teaching methods of the school is excellent. They teach very creatively and innovatively. Giving importance to extra-curricular activities also makes this school stand ahead of other schools. My kid has gained lots of confidence in her and is very happy and enthusiastic to participate in all school activities and competitions by the encouragement and abundant motivation given by the school. "